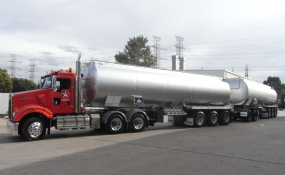 Lagos residents yesterday lamented the gradual return of fuel tankers to major roads in the metropolis barely a day after President Muhammadu Buhari's visit to Lagos for the All Progressives Congress (APC) mega rally that took place in the state at the weekend. LEADERSHIP learned that fuel tankers that were ordered to park at Ogere, in Lagos , Ogun suburb to allow for free movement of vehicles during the president's visit are gradually returning back to the roads, occupying the roads from Alaka inward Eko Bridge. It was observed that the articulated vehicles took over both lanes inward Eko Bridge leading to heavy vehicular traffic congestion in the axis. The residents had heaved a sigh of relief some days before the President's visit to Lagos, when the articulated vehicles were removed completely from the road from Fadeyi axis. The residents who spoke at separate interviews said they are wondering about the sudden reappearance of the Tanker and Containers on the roads if they could be kept away from the roads ahead of the visit by the President. A motorists , Wale Alani said, " These fuel tankers have been off the roads where they are permanently parked causing traffic for some time now before the president's visit to Lagos and we all rejoiced that the Nigerian Port Authourity have found solution to this problem of traffic congestion and menace caused by these tankers. They were restricted outside Lagos, allowing those that had consignments to come in. But it is sad few hours after the president left the roads are being blocked by these trucks". Also speaking the Chairman, Apapa G.R.A Residents Association, Brigadier General, Ayo Shola- Vaughan(rtd) described the latest development as sad and deliberate. He also accused the Task Force put in place to regulate how the vehicles access the Ports and the Nigerian Ports Authority of complicity in the whole issue. Vaughan said they will take legal action against the NPA and the owners of shipping companies after the expiration of 21 -day ultimatum they issued on the matter.